You Will Always Be My Number One Priority. I Promise. I Will Love You Always As Much As And More Than I Love You Today. My Love For You Will Never Dim, It Will Only Grow Stronger, I Promise. 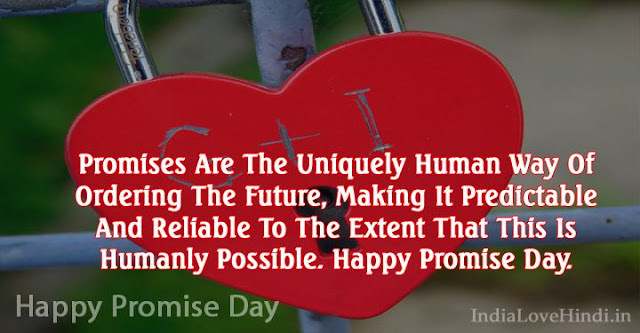 Promises Are The Uniquely Human Way Of Ordering The Future, Making It Predictable And Reliable To The Extent That This Is Humanly Possible. Happy Promise Day. The Most Precious Possession That Ever Comes To A Man Is A Woman’S Promise. Friendship Is A Promise Spoken By The Heart It Not Written In A Book. I Promise That When We Binge Watch Shows On Netflix, I Won’T Skip Ahead. True Love Always Demands Promises And Promises If Fulfilled Make Life Heaven. We Will Always Love Each Other Its A Promise! I Promise You No Matter What Happens I Will Be There With You Always. Promise Yourself: To Think only of the best, To Work only for the best and Expect Only the best. Dear Friend Promise Me you’ll always remember that you’re braver than you believe, stronger than you seem,and smarter than you think.